A completely newly developed luxury car was presented to the public in September 1972. The Mercedes-Benz S-Class with internal designation W116 replaced the 108/109 series and was the first series for which the name "S-Class" was officially used. Initial models consisted of the 280S and 280SE with 2.8 L inline-six engines and 350SE with a 3.5 L V8 engine. Six months later, the 4.5 L V8 engine was introduced wearing the 450SE and 450SEL badges, the latter with a 100 mm longer wheel base benefiting the rear passengers. From November 1973 the long wheel-base version was also available as the 350SEL, and in April 1974 also as the 280SEL. In May 1975 the 450SEL 6.9 was presented as the new top model of the range and as the legitimate successor to 300SEL 6.3. The powerful 6.9 L V8 engine, developed from the 6.3 L, achieved 210 kW and a maximum torque of 550 Nm. A hydropneumatic suspension with level control system guaranteed the highest driving comfort. Further equipment standard on the top model included central locking system, air-conditioning and headlamp washer system. The North American markets saw the introduction of the 300SD model in May 1978, the first time a diesel engine had been used in a luxury vehicle. The 3.0 L 5 cylinder, which had proven so well in the types 240D 3.0 and 300D, was fitted with a turbocharger for better performance to handle the larger car. The development of this unusual S-Class variant had been started with the goal to fulfil the lower consumption figures introduced by the US-government. The W126 series was presented at the Frankfurt motor show in September 1979 as the successor of the first S-Class range. W116 production stopped between April and September 1980, depending on the type. The last car that passed the final-assembly inspection at the plant in Sindelfingen was a 300SD. A total of 473,035 W116 were built over eight years. Even if the S-class had been introduced in 1972, the new big Mercedes was identified with the mighty 450 SE/SEL versions added the following year. It was the first modern-style car from Stuttgart, already with horizontal road lights installation instead of the classic vertical clusters. Brightest point, however, was the performance coming from the new 4.5 V8 with fuel injection and well over 200 hp; a figure partly tamed by 3-speed automatic transmission and optional limited slip differential. Today reality is millions of vehicles on crowded roads; roads that are often not all they should be. Obstructions, regulations, traffic lights, restrictions, bad weather, poor light, noise. The way the road users behave. They make mistakes, so do we - sometimes. And, above all, the fact that no two people are the same, neither physically nor emotionally. These, then, are some of the more important factors which influence us all as users of the road. We have to take them into account all the time and adapt to them. They influence continuously the way we feel and how we behave. But even under these conditions, motoring can still involve greater or lesser amounts of work, stress or relaxation. It is not only traffic conditions that determine the amount of stress, it is also the car you are driving. Whether the car leaves you on your own with all the problems or helps you with some of the work and communicates a feeling of confidence depends on the designers' objectives. Man, his reactions and his needs, should be the fundamental factors. In terms of passive safety the W116 incorporated all the latest technological developments. The fuel tank was no longer located in the rear end of the car, being positioned above the rear axle for protection against collisions. Inside, a heavily padded dashboard, deformable or concealing switches and controls, as well as a new four-spoke steering wheel with impact absorber and broad impact cushion provided for utmost crash protection. Important improvements in comparison to the preceding 108/109 series was the even more stable security passenger cell with stiffened roof-frame structure, high-strength roof and door pillars as well as reinforced doors. The energy absorption of the front and rear deformation zones were significantly increased by a controlled deformation capacity. Newly developed cowl panels at the A-pillars, serving as water-shield gutters, guaranteed good visibility in rain and kept the side windows clean in bad weather. Further safety details were wide wraparound direction indicators, well visible also from the side. In addition, broad rear lamps with ribbed surface profile proved to be very insusceptible to dirt. The W116 made extensive use of the knowledge gained from the C 111 and Experimental Safety Vehicles. A remarkable technical innovation introduced by the W116 was the twin control arm front wheel suspension with zero steering offset and brake dive support, improving the handling characteristics of the car considerably. 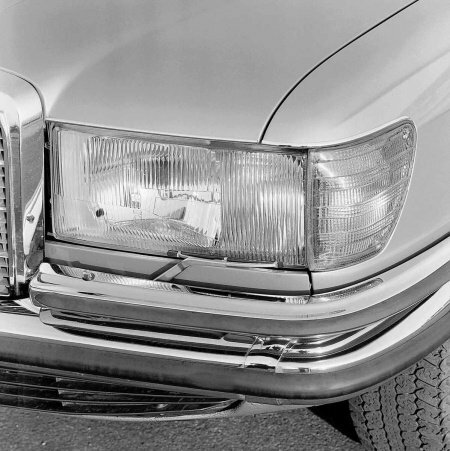 A technical innovation of lasting importance was available in autumn 1978, exclusively in the W116 S-Class: the antilock system (ALS) which had been developed together with the Robert-Bosch GmbH. It guaranteed the unrestricted controllability of the vehicle by preventing the brakes from locking in an emergency situation, thus contributing considerably to active safety.